This pate goes really well with a good crusty bread and a foraged salad. Cook the mushrooms with the onions, garlic, celery and nutmeg until all the liquid has evaporated, leave to cool for a while and blend until smooth. Add the chopped hazel nuts before or after blending, depending on the texture you would like the pate to be. Cook the lentils bay leaves and celery in the mushroom stock until fairly dry, cool, then remove the bay leaves and blend. Caramelise the red onion in a frying pan and leave to cool. Mix the two together with the lemon juice and place in a serving dish and top with the caramelised red onion and thyme. Chill to stiffen the pate and serve with a good bread and some wild green salad. Made with lots of butter instead of olive oil makes this pate very lush but not vegan. Hi, guys! 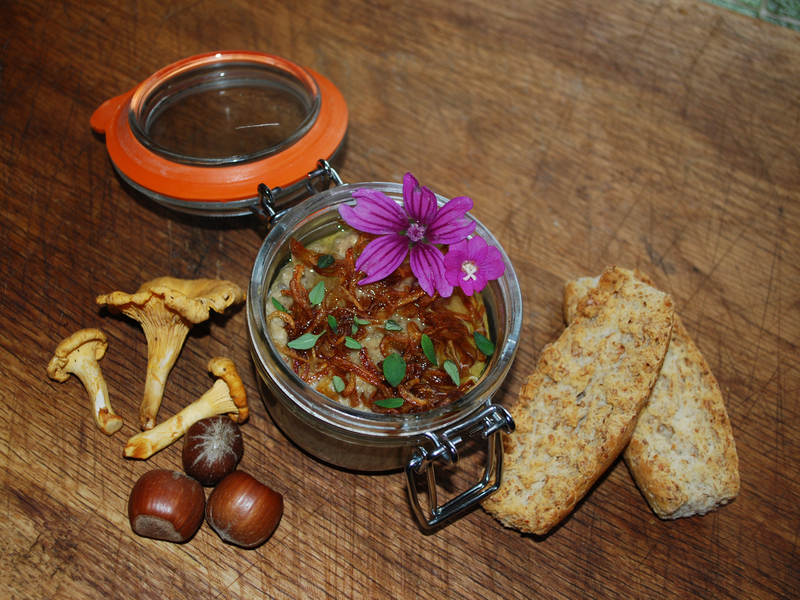 I fell in love with this pate when I went foraging with you. I liked it so much that I made it for Christmas. A small tip to make the lentils more gentle on the tummy is to soak them overnight, give them a simmer and discard that first water, then cook as usual. As I am a runner that has to take care of her weight, I used light spreadable butter instead of oil or regular butter and the result was amazing. Thank you.